Whitney Badge is a graphic designer based in New York City. She is graduating from Parsons School of Design with a BFA in Communication Design. 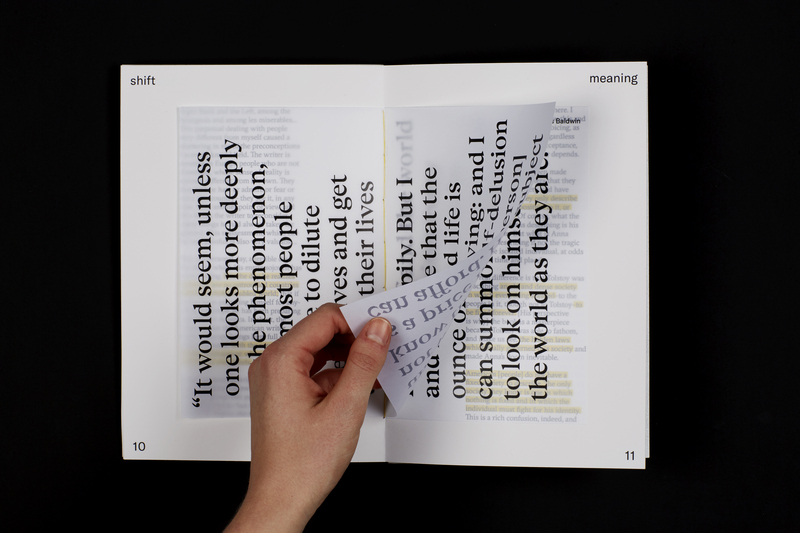 She is inspired by the relationship between context and value to understand how people assign meaning. From identity design to digital interaction, she takes this approach in all aspects of her practice. Digital Interactive Process: I removed an excerpt of James Baldwin’s writing from its original context and present it to the viewer, inviting them to type in a new word and create meaning that reflects their personal values. Using that same word, news articles and Twitter comments are displayed on the screen. As the viewer attempts to click on each link, new tweets are displayed on top of the articles. The comments are draggable, but the purpose of this experience is to suggest that both elements, formal articles and internet commentary, cannot exist separately from one another. Research Journal Process: My research journal features selections of James Baldwin’s writing, placed in the context of current issues to analyze how people assign and process meaning. Internet commentary was printed on Post-It notes and placed on top of the page. In order to understand the full context, the commentary must be physically removed by the viewer. Advice: Design is not something to be conquered. Design is a practice (I’ll say it again–a practice!) that’s meant to keep you challenged and motivated to grow in new ways every day. Stay humble and focused. Want to know more about Whitney Badge?